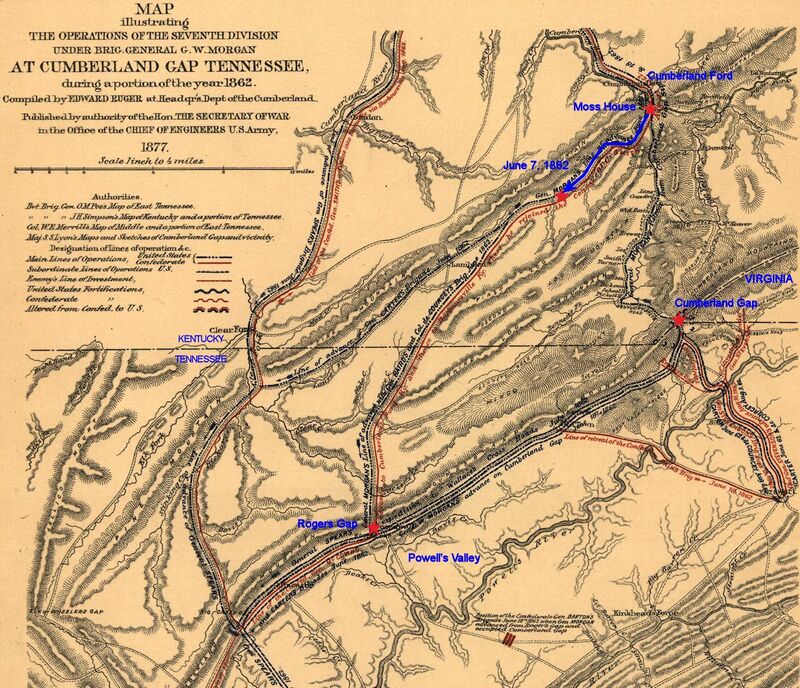 On this day at 6:00am, the regiment, with Gen. Baird's and Col. DeCourcey's brigades, left its camp near the "Moss House" in southeastern Kentucky and began its march to Rogers Gap, on its way toward taking the strategic Cumberland Gap from the Rebels. The troops marched eight miles through very hilly country. The busy camp life at the Moss House ceased on the 7th day of June. On that day, with knapsacks packed and eighty rounds of ammunition, we filed out over the densely wooded hills with our column headed toward the southwest. All day through the wild looking forest that was clad in the rich foliage of the season, we marched steadily on. Many a good army overcoat was that day thrown away by soldiers that tried to lighten their loads that were becoming oppressively heavy. Long before sunset we halted and waited for our wagon train. When it came up we pitched our tents in a narrow green valley that afforded plenty of good water for the boys to bathe their fevered feet and sweaty bodies. Picket guards were thrown out on the surrounding ridges. Night settled over us. So in darkness and silence we rested secure until dawn. In the meantime another brigade was pushed forward towards Lambdin's (farm). Never before had wagons attempted to pass that road, over what is known as the Bushey Mountain, and men and horses frequently toiled at the same ropes in dragging the guns up the steep ascents. As soon as one brigade had passed, the masking brigade was sent forward under cover of night and another brigade took its place, a new battery being placed in the position whence the other battery had been withdrawn. In this manner the entire Division was removed from Cumberland Ford. * Above quotation taken from The Forty-Second Ohio Infantry - A History of the Organization and Services of That Regiment In the War of the Rebellion, 1876 - F. H. Mason, late Private of Company A - Cobb, Andrews & Co., Publishers. Military map showing the approximate route of the 16th Ohio from its camp at The Moss House, near Cumberland Ford, Kentucky, southwest along the Log Mountains on June 7, 1862.